What if it were possible to predict where a message in a bottle was going to end up? Removing the mysticism of that archetypal fate-guided, maritime missive could turn out to be a key to keeping the Navy’s autonomous robots afloat. In the Scalable Autonomous Systems Laboratory in Drexel’s College of Engineering, Dr. Ani Hsieh is studying the currents in bodies of water, with the help of sea-faring autonomous robots that she’s developing, in hopes of producing a road map –of sorts. 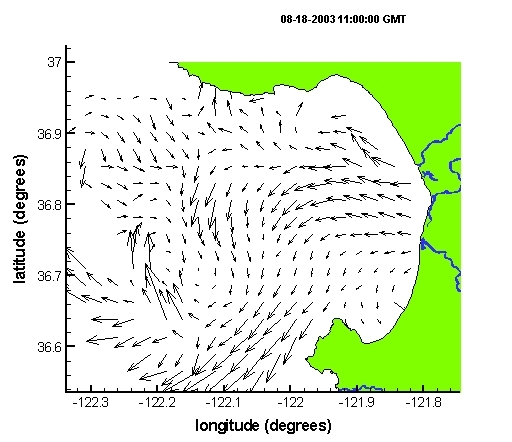 What she’s searching for are flow boundaries -the places where currents moving in different directions converge to form areas of powerful, directional flow. This information will be used to generate nautical models that will guide the Navy’s unmanned, autonomous vessels. By traveling with the strong ocean flows, the Naval crafts can conserve energy, which will enable them to remain at sea for long periods of time. Hsieh’s robots will help to generate ocean current maps much like the ones produced by researchers from Cal Tech using coastal radar at Monterray Bay in California. Photo courtesy of Dr. Shawn Shadden. 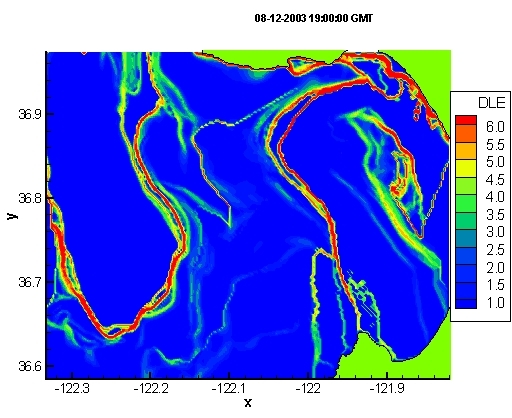 Technology developed in Drexel’s Scalable Autonomous Systems Laboratory will help produce flow maps, like this one of Monterray Bay, of the oceans. Photo courtesy of Dr. Shawn Shadden. To learn about mapping the movements of the world’s largest bodies of water, Hsieh is starting by studying the movements of water in a plexiglass tank the size of a bath tub. With a grid of motorized turbines in the tank, Hsieh can control water currents and closely examine how they interact. Playing the role of the message-in-a-bottle in this scaled-down experiment, are tiny plastic pellets that float in the water. With the aid of the pellets, Hsieh can accurately discern the flow boundaries by observing the places where the pellets congregate and flow in a single stream. As Hsieh scales up the size of the bodies of water she’s studying, she’ll also increase the size of the robots she’s using to study them. 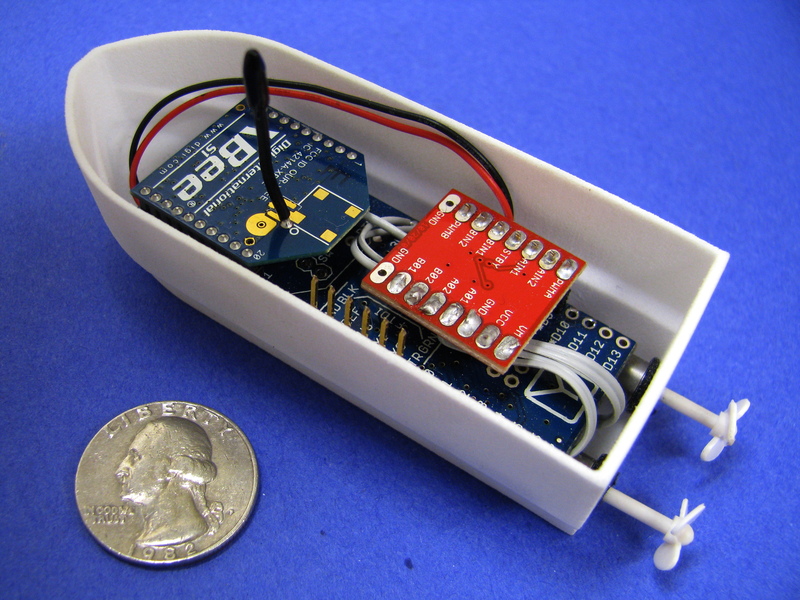 Currently, researchers in her lab are using a radio controlled boats that could easily be mistaken for a bathtub toy. But what the tiny vessel lacks in size however, it makes up for in the lessons that it can teach this group of engineers. While floating in Hsieh’s flow-controlled tank, the boat can demonstrate the effects of the currents on autonomous robots, the challenges they will face in accurately collecting data and approximately how much longer they could last by traveling along the boundaries of the oceanic currents. Hsieh, whose work will continue as part of a National Science Foundation CAREER award for at least the next five years, is planning to develop her robots to the point where they can gather data in field trials in lakes and bays before passing the technology along to the Office of Naval Research.